Considering a Sri Lankan wildlife safari adventure tour? Consult our team of travel experts who will help you plan your trip on a budget, or take you on a luxury safari if so required. 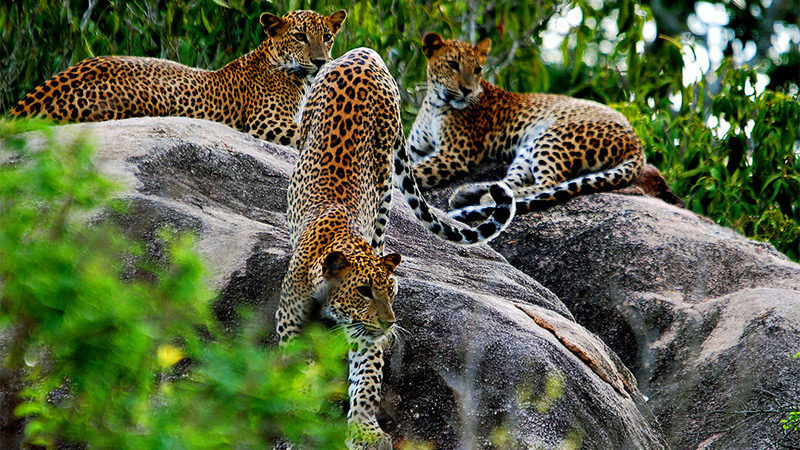 You’ll certainly get to see all the wildlife and tropical birds you’ve never dreamed of seeing – including of course the famous but elusive Leopard, while at the same time taking in our natural brilliance of Sri Lanka, fauna and flora under clear skies. There are so many thrilling wildlife safaris you could choose from, and you’ll find that most are suitable for families. You’ll see a lot of elephants and birds, be able to take lots of photographs, as well as experience our unique ever smiling mix of people and cultures. You’ll simply have a great time here! A wide range of National Parks, nature reserves and safari lodges and camps have been established throughout Sri Lanka, covering vast areas of bio-diverse terrain, all the way from Willpattu National Park in the north of the country, down to Yala National Park in the south with many others in between. Plenty of wildlife for you to see and lots to do, and no, not about hunting that was done away with about a century ago, after the Sri Lankan elephant population were decimated by big western game hunters. You’re out there to enjoy, get close to and photograph Sri Lankan wildlife and birds in their natural environment. On your Sri Lankan safari Tour you’ll also tour through some outstanding scenery. Travelling into the jungles of Sri Lanka with camps set deep within the national parks is yet an undiscovered treasure, whether you select to stay and observe wildlife in your camp under a tree reading a book and sipping a drink of your choice waiting for them to appear, or taking a short walk to the best spots within the area under the guidance of our experts. Tented Safari camping in Sri Lanka is an ideal way to savour the splendour of the island from one of the many spots available for such wildlife safari camps. The game reserves of Sri Lanka are best savoured from such a camp than trudging up and down from a hotel! You may select a tour from a wide range of tours or enjoy one tailor made just for you. Observing nature and its diversity is best done in our opinion in one such camps, whether its fauna, flora, bird watching or even interacting with the local indigenous people “Veddha’s”.